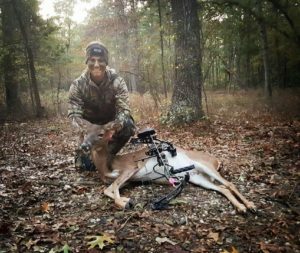 Harvesting an animal with my compound bow has proven to be one of my most memorable accomplishments as a hunter to date. The first deer I harvested with my Bear Cruzar G2 compound bow was not a monster buck. Instead, the first whitetail I harvested with my bow was a doe. She was a good sized doe. She wasn’t the largest I have ever shot, but she was and is still a personal trophy of mine. I have shot dozens of deer since the start of my hunting career at the age of 10 years old. What is it that makes that particular deer so special? With archery, there comes an intimidation factor that I don’t feel is as present when hunting with a firearm. 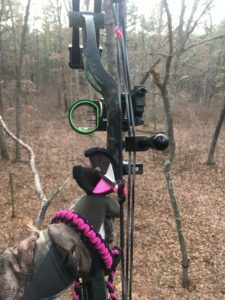 When a person can prepare themselves to overcome those intimidations or fears, and be successful in the field with a bow, it is a memorable feeling like no other. There are ample steps that hunters can take to prepare themselves physically for a bow hunt. I have come across many resources that explain the physical preparation a hunter should take to become proficient with their bow. 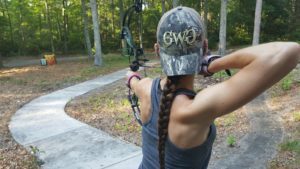 Working out to build up strength and stamina, consistently practicing with your bow, making sure the right arrows and broad heads are used, and getting accustomed to your gear, are among top recommendations that I see when it comes to bow hunting. What I don’t see often is advice on how to mentally prepare for a bow hunt. I personally feel that mentally preparing yourself for a hunt at full draw is just as important as physically preparing yourself. But how does one mentally prepare for a hunt at full draw? 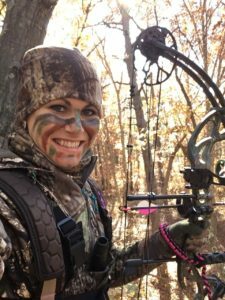 Why is it necessary to prepare mentally for a bow hunt? Or more importantly, what is it about bow hunting that deems intimidating to new hunters? I want to start by tackling why I was personally intimidated to start bow hunting. I have been a gun hunter since the age of 10. I started hunting with a 20 gauge Browning A5 Belgian Edition Shotgun. I believe it was on my 11th birthday that my parents bought me a little PSE compound bow. I enjoyed shooting the bow, but I was not strong enough to pull back the 35 pounds necessary to legally deer hunt in New Jersey. I remember my dad giving me dumbbells to try to increase my strength. I soon lost interest in shooting my bow though. It wasn’t until college, when my husband went to take his bow test, that I started rethinking bow hunting. What was stopping me from taking the leap? I did not think I would ever be efficient enough with a bow to harvest an animal. I was full of self-doubt. I did not think I would be steady enough at full draw, since most of the deer I previously shot were with the assistance of a gun rest. There were also many ‘Negative Nancys’ around bashing people for jumping on the “bow hunting band wagon.” Lastly, I wasn’t sure that I was strong enough to pull back that 35 pounds necessary to hunt with a bow AND hold it back before I executed an ethical shot. Going out with a primitive weapon, knowing that there were many margins for human error, and trying to harvest a deer with that weapon scared the living daylights out of me. How did I overcome those intimidations after owning my bow for only two months? I gained confidence. I gained confidence in myself, as well as confidence in my equipment. Confidence comes with preparation. Mentally preparing for a hunt goes hand-in-hand with preparing physically. Preparing physically by practicing routinely helps a hunter prepare mentally by increasing confidence. All of the shows and articles that I have watched and read about bow hunting have been completely right. It is essential to gain strength and stamina to be able to draw your bow back and eventually increase your poundage. It is essential to learn about different gear and accessories to make sure you get a bow that fits you, arrows that fit your bow and draw weight, and proper broad heads for the poundage you are shooting. Practicing routinely is essential for developing muscle memory and helping you anchor to the same spot consistently. When all of these things come together, confidence grows. That comment made me chuckle, stuck with me, and it also made me realize that I needed to just focus on myself. I anchor to the same place without a kisser button each time I draw. My elbow may be a little high when I shoot. My nose may not be “smashed” into the bow string like some have recommended, but I am consistent and accurate with my shooting. That is the only thing that matters. Mentally preparing to execute beautiful shots at an archery range, in a controlled environment, is the easy part. A hunting situation is completely different. When a deer walks in, the adrenaline turns on. There are several factors to take into consideration when thinking about executing a shot. You start to think about distances, pins, environmental factors, when to draw back, when to release, and so much more. How is it possible to mentally prepare yourself to overcome all of the obstacles, in order to execute a lethal shot on your target? I can’t speak for others, but I can tell you what I do. This may sound silly, but I talk to myself. Not aloud, but I give myself pep talks in my mind. When I’m in the stand and finally start to see deer, my heart starts racing. I’m sure all of the other deer hunters out there know that feeling. When my adrenaline starts pumping, I give myself a pep talk and tell myself to breath. One of the worst things you can do while bow hunting is hold your breath when you are at full draw. Typically the first deer that walks in is not a shooter, but I mentally prepare myself to execute a shot on that deer. Yes, you read that correctly. I walk myself through the steps of shooting a deer that I know I am not actually going to shoot. Usually the first deer I see while hunting are around 40 pounds. I look at the deer and pick out the kill zone. As the deer walks in, I pick out the 30, 25, 20, and 15 yard distances that I previously mapped out with my range finder. I think about what pin I will use at different distances. As the deer quarters at different angles, I think about how my shot placement needs to change. I also think about where I want the deer’s head placement to be when I finally draw back, so the deer doesn’t pin me. This may not work for others. Going through these steps has allowed me to calm myself down and execute lethal shots when a shooter finally does come into range. After I shot my first deer with a bow, I was asked how nervous I was. To be completely honest, I wasn’t nervous at all. It was as though time stood still. I was shocked afterwards at how calm I was. In that moment, with a shooter underneath me, I was solely focused on what I needed to do in order to deliver a clean shot. It was like there was no time to be nervous. This past season, I personally know multiple hunters that have executed poor shots on whitetail with their bow. This is obviously something that no hunter wants to do. People outside of the hunting community don’t realize how painful executing a poor shot on an animal is for a hunter. What is it that causes a hunter to execute a poor shot? Sometimes there are variables outside of the hunter’s control that can interfere with a lethal shot. The deer can duck an arrow. There may be a small piece of brush or limb in your shooting lane that wasn’t seen. There can also be human error involved. Some hunters can let the nerves get the best of them, or they may not follow through with their shot. One of the best pieces of advice I can give to new bow hunters is to treat the animal you are hunting just like a target. When you draw back, think of the animal just like you would any target at the range. Picture the “bullseye” on the animal. Focus in on that kill zone. Squeeze off your trigger gently, and follow through! Treating an animal like it is a target is one of the best pieces of advice I received before I started bow hunting. This advice actually came from my husband’s old supervisor, Ted. At a wild game dinner, we were talking whitetail hunting and bow hunting. Ted said the biggest mistake he made while bow hunting was cheating. He explained cheating as trying to see where his arrow was going. He explained that when you pull your head away from the bow too soon and don’t follow through, your arrow’s path will be greatly influenced. He then told me to treat a deer just like it is a target. Make sure to follow through, and don’t worry about where your arrow is going. If you aim properly and follow through, your arrow should go where you are aiming. That advice has stuck with me, and it is something I think about every time I am in the stand. Unfortunately, my husband is one of the people I know that recently executed a poor shot on a whitetail. I know he put the practice time in at our archery range. I know he was confident with his equipment. He consistently put arrows in the bullseye of targets and even split an arrow. So what happened in the field? I have a feeling he did exactly what his old boss told me not to do- peak. My husband thought he had put his shot placement a little too far forward on the deer. In reality, his arrow was placed over a foot back from the desired kill zone. It just comes to show that even if you are near perfect at the range, things can go wrong. After we eventually recovered the deer, I was afraid that this hunt would ruin him. One of my biggest motivators to write this blog was my husband. I know that what he went through is something that other hunters have felt. When I finally helped him recover that deer, I was there to give him a pep talk. I was there to lift his spirits and tell him that it was alright. Not every hunter has that support though. That is why I felt it was essential to share how I prepare to execute that shot. True hunters are the biggest conservationists and lovers of wildlife. We want nothing more than to deliver a clean shot and ethical kill. As a bow hunters, it is essential to accept that a poor shot is inevitable to happen at least once. This does not make you an irresponsible hunter. Accepting that a bad shot can possibly happen, and being able to deal with the consequences, is part of growing as a hunter. As responsible hunters, we need to do everything in our power to prepare physically and mentally for our hunt before entering the field. If you have done exactly that, and still executed a bad shot, do NOT be hard on yourself. Know that it happens to the best of the best. The most important thing to do is to learn from your mistakes and don’t let them ruin you as a hunter. If you have any questions about archery or hunting in general, feel free to reach out to me on social media. I love connecting with others that share the same passions as me!